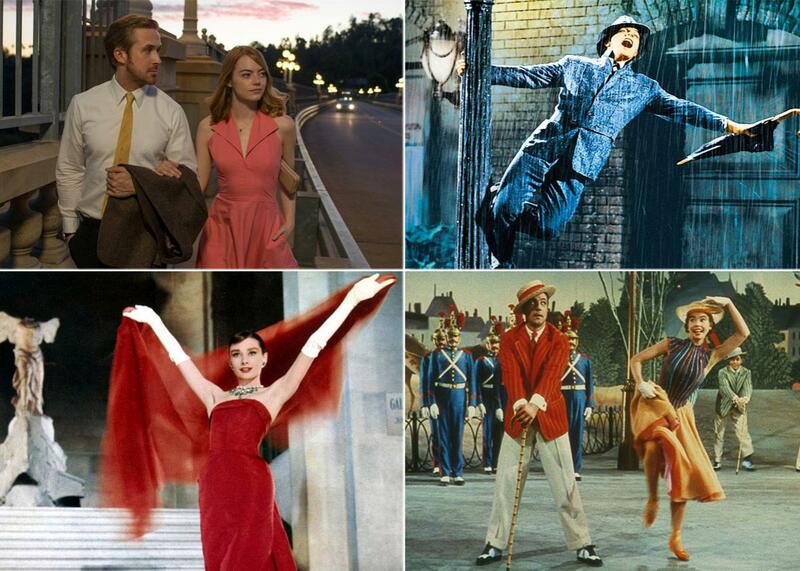 La La Land’s many references to classic movies, from Singin’ in the Rain to The Red Balloon to Funny Face. 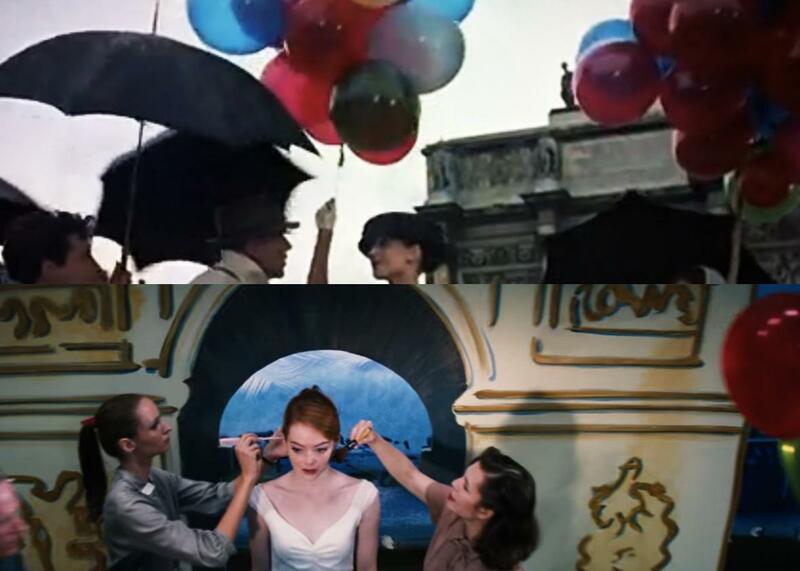 La La Land (top left), with a few of its inspirations: Singin’ in the Rain (top right), Funny Face (bottom left), and An American in Paris (bottom right). Photo illustration by Slate. Images by Lionsgate, MGM, Paramount Pictures. 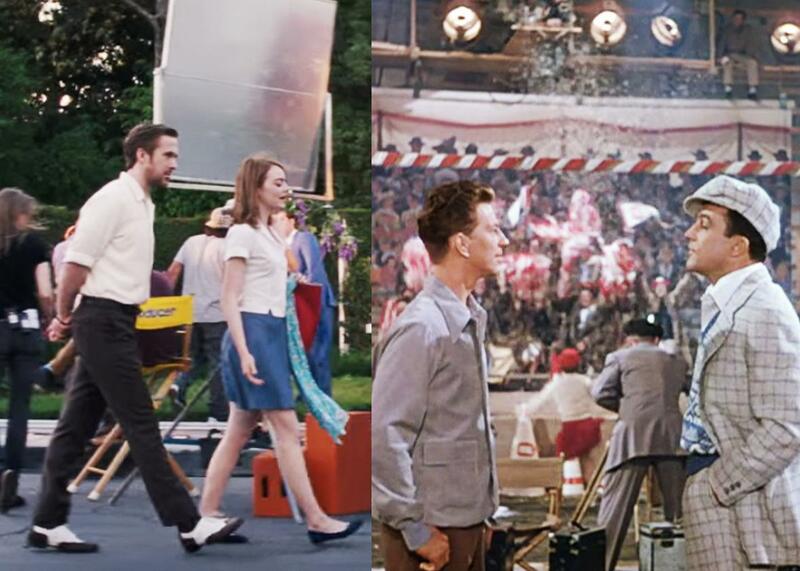 But writer-director Damien Chazelle also peppers La La Land with an abundance of more subtle allusions to classic films, and especially musicals of the ’50s and ’60s, including Singin’ in the Rain, The Umbrellas of Cherbourg, Funny Face, and more. Below, a guide. 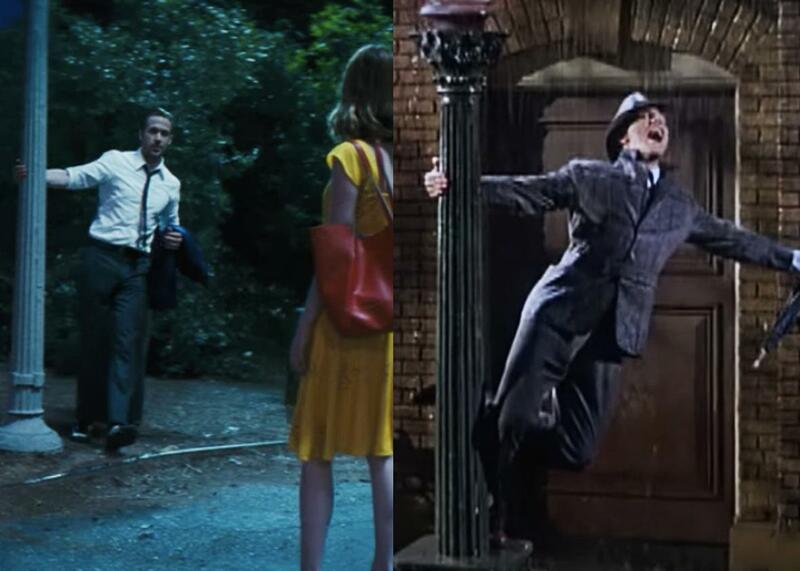 Chazelle hasn’t been shy about naming the Gene Kelly–Stanley Donen musical as an inspiration, and there’s no shortage of callbacks to be found here. The meet-cute between Mia and Sebastian at a pool party where Sebastian is playing in an ’80s rock cover band resembles that of Don (Kelly) and Kathy (Debbie Reynolds) in Singin’ in the Rain. When an annoyed Sebastian defends his honor by referring to himself as a “serious musician,” she teases him by saying that she’s a “serious firefighter” (a callback to an acting part she’s auditioned for). Likewise, Kathy states that she’s a “serious actress” of the stage, scoffing at Don, the movie star. Of course, both couples soon fall in love with each other. In a less subtle allusion that comes during “A Lovely Night,” the charming duet performed against the backdrop of an Los Angeles skyline, Sebastian does a quick swing around a lamp post, in a manner just like Kelly in Singin’ in the Rain. 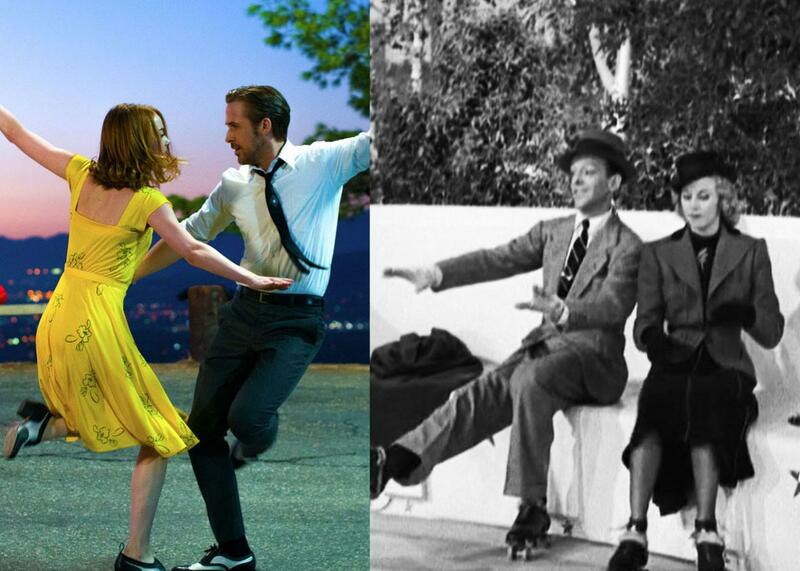 Left: La La Land. 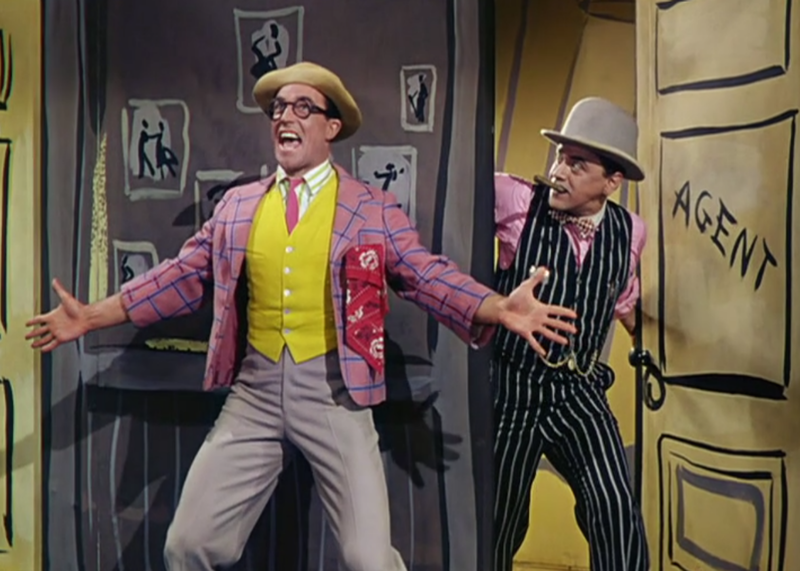 Right: Singin’ in the Rain. 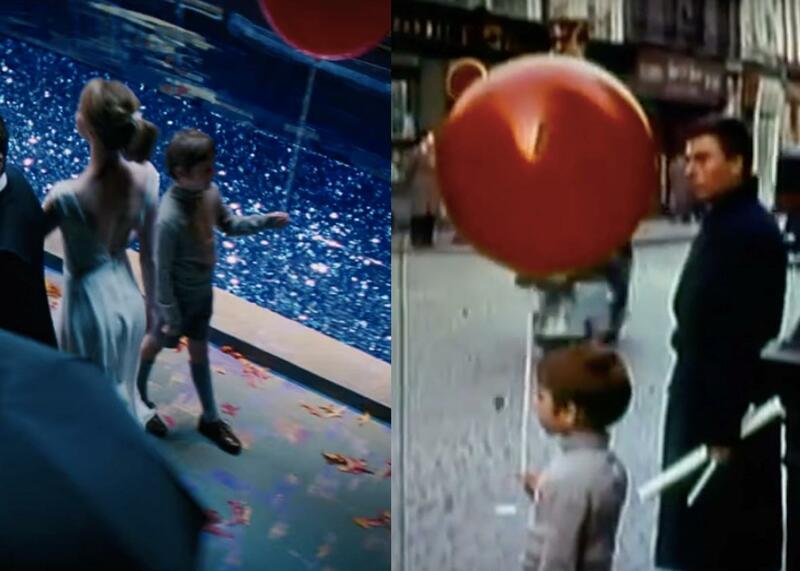 Elsewhere, Mia and Sebastian’s stroll past a row of different scenes being shot on movie sets is reminiscent of a scene in which Don and his pal Cosmo (Donald O’Connor) do the same. 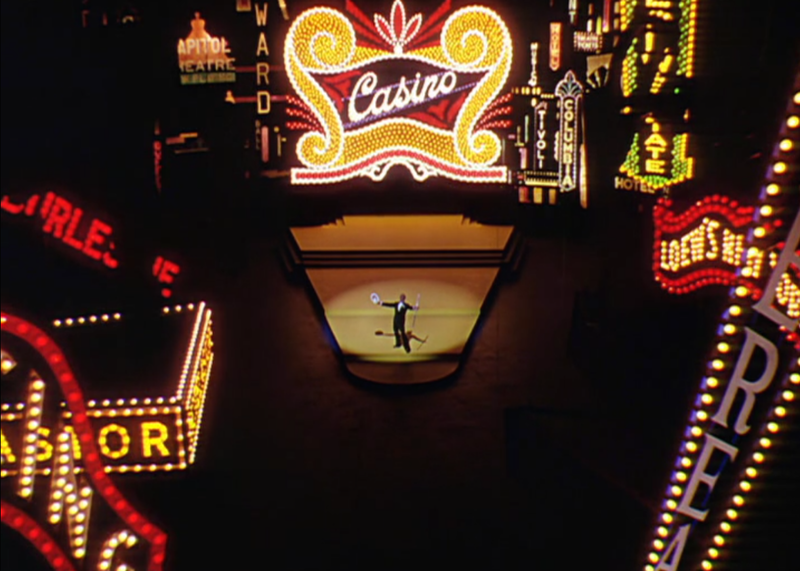 And several elements of La La Land’s “Epilogue,” the finale in which Mia and Sebastian dream of how their lives may have turned out differently, strongly resemble elements from Singin’ in the Rain’s “Broadway Melody” ballet, especially the collage of neon signs, the appearance of the casting director from Mia’s “Audition (The Fools Who Dream),” and the red-and-yellow color scheme. 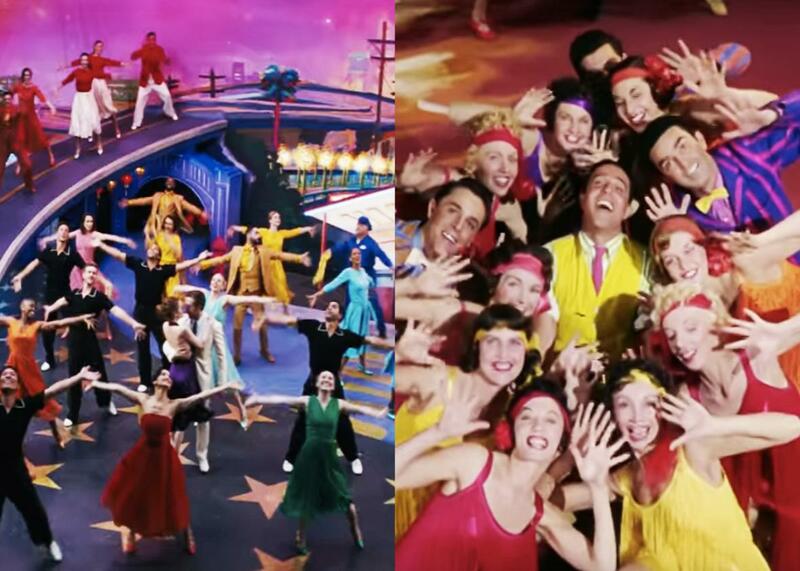 The “Broadway Melody” ballet in Singin’ in the Rain. 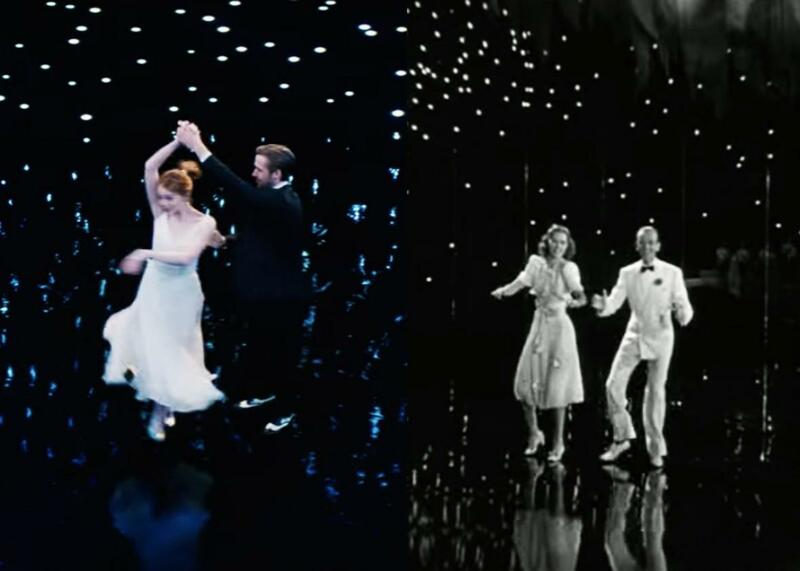 La La Land’s “Epilogue” also seems to borrow heavily from this other Kelly film, particularly in its Parisian-themed set design and even its costuming. Several male chorus dancers wear black short-sleeved topz and pants with white trim, like the ensemble Kelly wears during An American in Paris’ ballet number. 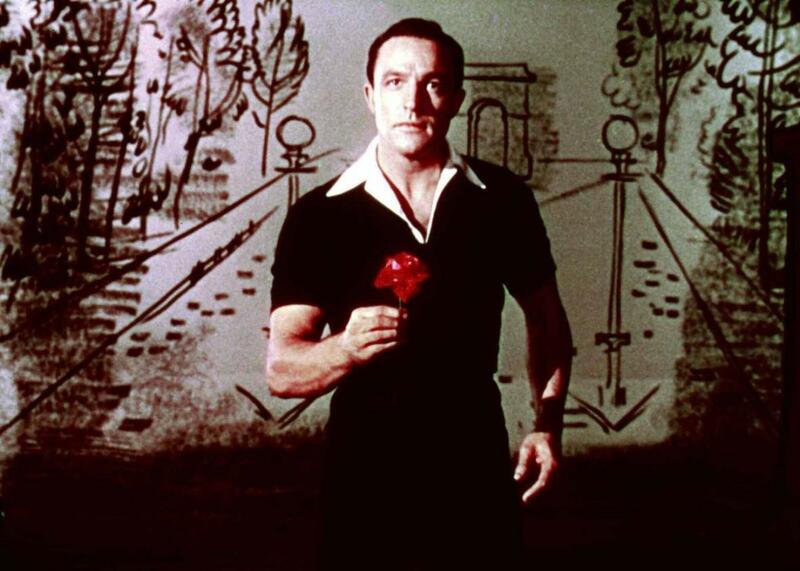 Gene Kelly, in front of a drawing of the Arc de Triomphe, in An American in Paris. La La Land’s story is broken up into seasons that are marked with on-screen titles, not unlike Jacques Demy’s classic French musical. Both end bittersweetly, with the former lovers briefly reuniting for the first time in years. And in the scene where Mia points out the Casablanca window, there’s a door marked “Parapluies,” as in the movie’s original French-language title, Les Parapluies de Cherbourg. 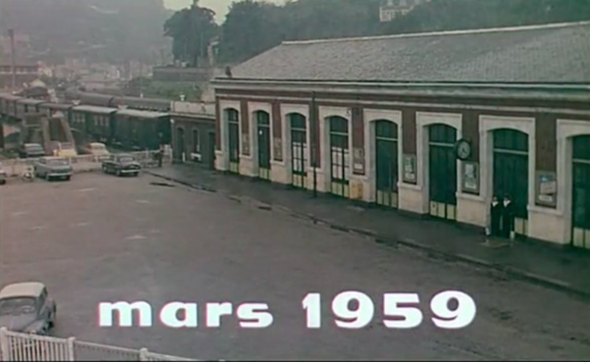 An on-screen title marks the season in The Umbrellas of Cherbourg. “A Lovely Night,” the charming duet performed against the backdrop of an L.A. skyline, feels like an Astaire and Rogers number from its head down to its (tap-shoe–clad) toes. The song itself, in which the two pretend not to fall for each other while … falling for each other, borrows a page from many other classic musicals, including Astaire and Rogers’ Swing Time: In that movie’s “A Fine Romance,” Astaire and Rogers even do it while Astaire, just like Gosling, walks his partner to her car. 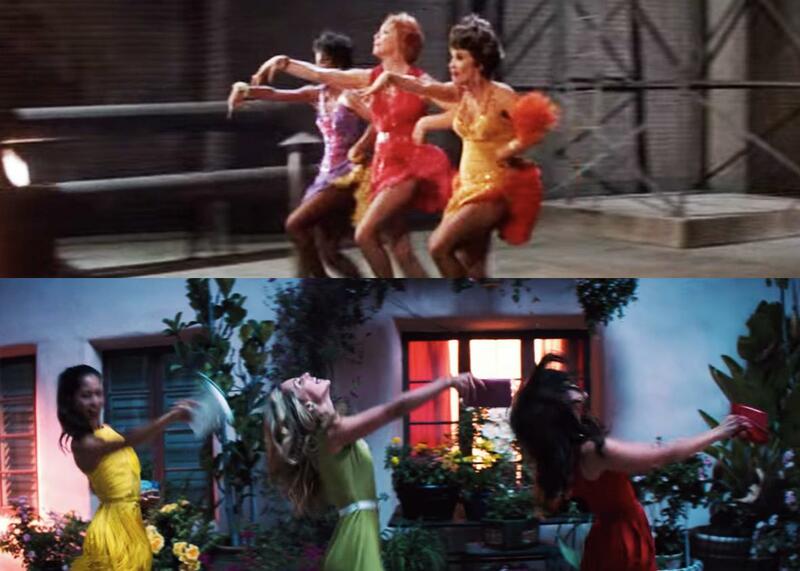 The casually executed choreography also resembles “Isn’t It a Lovely Day (to Be Caught in the Rain)” from Top Hat and “Let’s Call the Whole Thing Off” from Shall We Dance. Left: Emma Stone and Ryan Gosling in La La Land. Right: Fred Astaire and Ginger Rogers in Shall We Dance. 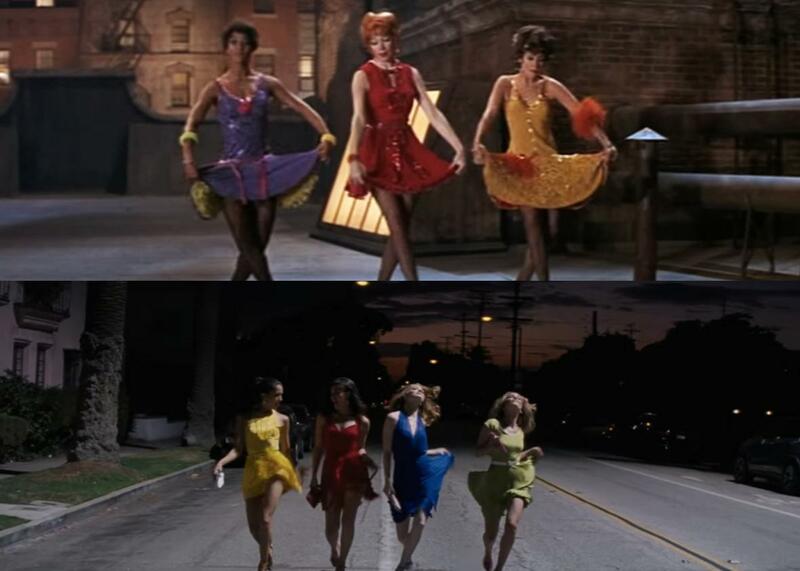 La La Land’s “Someone in the Crowd” is the “going out” song, with a rambunctious intensity and colorful visual palate that calls to mind the all-female number “There’s Gotta Be Something Better Than This” from the 1969 film adaptation of Sweet Charity. The choreography is nowhere near as intricate or exciting as Bob Fosse’s, but Mia’s girlfriends sashay and whip their dresses around as though they were Charity, Nickie, and Helene, eager for a new lease on life. Top: Sweet Charity. Bottom: La La Land. At the first pool party scene, the camera dives into the water along with its guests, capturing bodies floating and swimming in a dreamlike manner. Mikhail Kalatozov’s 1964 film about life during the Cuban revolution opened with a famous and technically wondrous (for its time) long take that roams about the many nooks of a Havana luxury hotel, finally ending with the camera diving into the pool behind a woman and lingering upon the bodies that pass it by underwater. Decades later, writer-director Paul Thomas Anderson mimicked Kalatozov in Boogie Nights. Left: La La Land. Right: Broadway Melody of 1940. 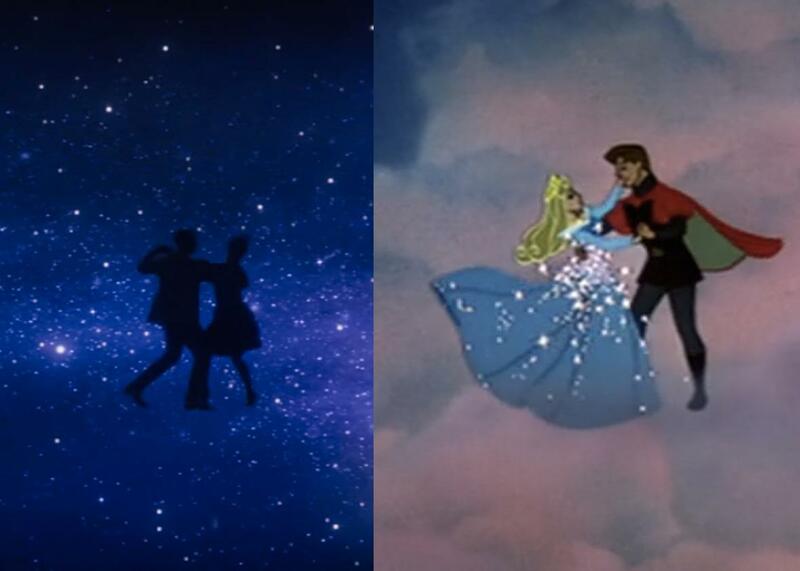 In the final scene of Disney’s animated classic, set to “Once Upon a Dream,” Aurora and Phillip waltz into the clouds. Perhaps Chazelle was inspired by this for his flight of fancy into the stars of the observatory in La La Land? Left: La La Land. Right: Sleeping Beauty. Top: Funny Face. Bottom: La La Land. Left: La La Land. Right: The Red Balloon.